An oral exam is routinely performed by your dentist during the course of an initial comprehensive exam and regular check-ups. An oral cancer exam refers to the identification and management of diseases pertaining to the maxillofacial and oral regions. Antibiotics – In the case of a bacterial infection or persistent soreness, the oral surgeon may prescribe a dose of antibiotics to return the mucosa to its natural state. This will alleviate soreness and discomfort. Diluted Hydrogen Peroxide – When poor oral hygiene is causing changes to the soft tissue, the oral surgeon may prescribe a diluted hydrogen peroxide mouthwash. This will kill more bacteria than regular mouthwash and improve halitosis (bad breath). Oral Surgery – If the patient has cysts or abnormal non-cancerous growths, the oral surgeon may decide to completely remove them. This can improve comfort levels, alleviate breathing problems, and make speech substantially easier depending on the location of the cyst. During the course of a regular check up, your dentist will thoroughly inspect the soft tissue of the mouth and take serious note of any changes. If there are cell changes present, he/she will refer the patient to an oral surgeon to take a biopsy of the affected area and send it away to be analyzed by laboratory specialists. When definitive results are obtained, the oral surgeon can decide on the best course of treatment. 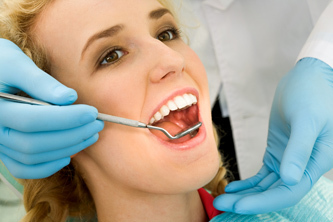 An oral cancer screening is usually performed during a comprehensive or recall (check-up) exam. Screening is painless and only takes a few minutes. The dentist or hygienist may use a laser light to assess the soft tissue for cell changes that might be indicative of oral cancer. If such cell changes are present, a small biopsy will be taken by your oral and maxillofacial surgeon and sent to a laboratory for review. If the biopsy indicates that oral cancer is present, an excision (removal) will generally be performed.